What if you could travel 1,000 years into the past? What would you do? What would you change and where would you go? 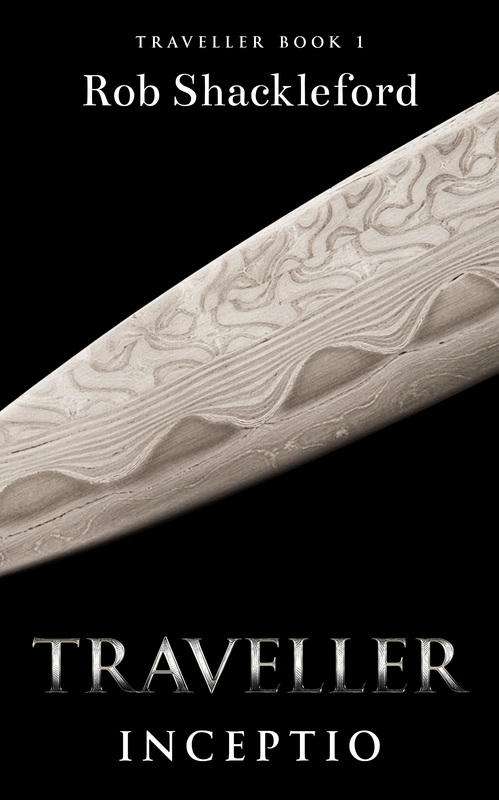 These are the questions raised in the first book, Traveller – Inceptio, of Rob Shackleford’s recently published science fiction trilogy, the “Traveller” series. The novel begins with a mysterious character, Michael, alone in the woods. We see the world through his eyes as he tries to make sense of his surroundings and take note of all he can. Michael eventually makes his way to a small Saxon town where his knowledge, sword skills, and hunting ability lead the monks of the local monastery to believe he is the Archangel Michael sent by god to help protect them from the invading Vikings. This storyline alone would be interesting enough, but Shackleford has interwoven it with another. Set in the present, a group of postgraduate university students from various fields are accepted into a research project supported by the powerful Helguard Security Company. The group is tasked with developing a new security screening system to be used in large-scale vessel scanning and border security. In the process, the students unwittingly invent ‘The Transporter’; a mysterious machine with the ability to transport a person 1,000 years into the past. Now we see Michael’s story in a whole new light! The issue with the first few chapters is that, because of book marketing and the book’s published cover blurb, the reader already knows the students invent a time machine. This makes the beginning of the novel slower than I would have liked. But I recommend sticking with it, for once ‘The Transporter’ gets into action and the first humans travel back in time, excitement builds and the genre comes into its own. The story ultimately revolves around classic time travel conventions: how much impact can (should) a traveller have in the past? Is it possible to change the future? What risks and benefits are there in going back at all? I was a little surprised to see the group of students turn to fiction for help in understanding their new discovery. Fiction seems an illogical source to go to for information on time travel but it makes for a nice read, giving a respectful nod to classic time travel novels, as the students discuss Ray Bradbury’s A Sound of Thunder and argue over the butterfly effect. Shackleford does well to build suspense, depict rising action and end chapters on a cliff hanger, but the story ultimately suffers in the details of the present tense. The chapters are short, easily consumed and the narrative transitions well between stories to keep you reading. But this is a hard novel to review, as the historical plot and the present tense plot are very different, almost needing to be reviewed separately. It’s the present tense plot line I found a little more challenging. There are small inconsistencies in this book that pull the reader out of the narrative asking, “Is that really how a surfer would talk? Is that really how a university supervisor would behave? Do they really have the ability to find bugs hidden in their walls?” A couple of characters are a little clichéd. The surfer boys smoke dope and watch old movies, the promotion girl at the bar is a long-legged blonde, and Mel, one of the students in the research group, is described as a geeky girl with glasses. Overall I enjoyed reading this novel, and I’d be fascinated to see where the series goes. Viewing the past through the eyes of an outsider was an enjoyable experience, as was the escapism of being in a different world. I wasn’t a big fan of the present tense plot lines and found them less believable. The novel could also have been edited for a much tighter read, but those wanting to do a little wandering through the past might not mind. I would recommend this book to readers who enjoyed The Saxon Stories by Bernard Cornwell or the “Outlander” series by Dianna Gabaldon. This novel will appeal to readers who love reading time travelling science fiction but still hold a place in their hearts for historical fiction.